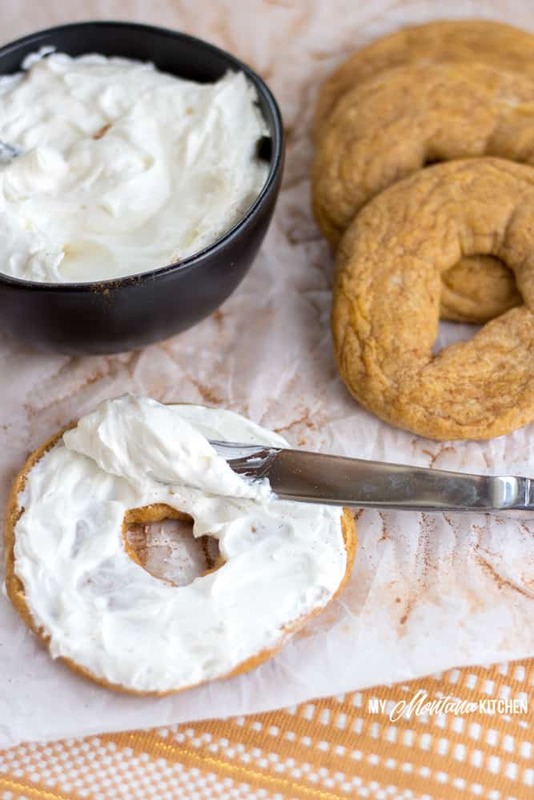 Dense and slightly chewy, these Low Carb Pumpkin Bagels are filled with the flavors of Fall. Perfect when toasted and topped with my Whipped Cream Cheese spread! 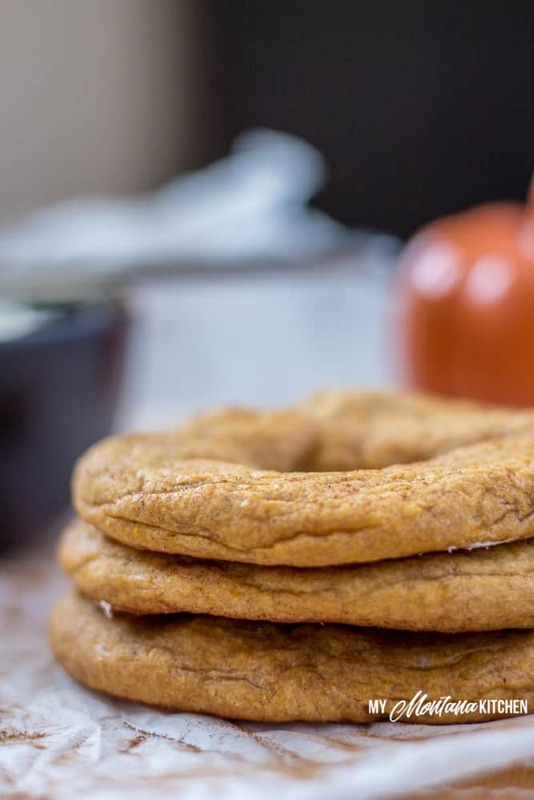 These pumpkin bagels are also completely gluten free, keto-friendly, low carb, and can be enjoyed as a Trim Healthy Mama S Fuel. I suppose some of them will have to wait for another time. In my pre-healthy eating days, I would love to have a bagel with cream cheese for breakfast. But unfortunately, most bagels are just dense unhealthy, junky carbs. Add cream cheese to the mixture, and you have a serious clashing of fuels for Trim Healthy Mamas! It’s no wonder I was crashing when I was only halfway through my morning! My blood sugar was a wreck! 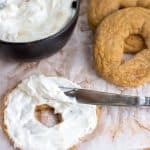 But with this Low Carb Pumpkin Bagel recipe, I can thoroughly enjoy a bagel with cream cheese for breakfast – and no guilt! There are so many variations to the popular “fathead” dough – and I love how versatile the dough is. I use variations of this dough for many things, including Low Carb Stromboli, Sausage and Cheese Calzones, Bacon Jalapeño Popper Pizza, and Low Carb Hot Pockets. A few weeks ago I wondered what would happen if I added pumpkin, spices, and a touch of sweetner to the mozzarella dough. The result was a delicious fall treat! Plus, these bagels are a good source of protein because of the cheese in the dough. 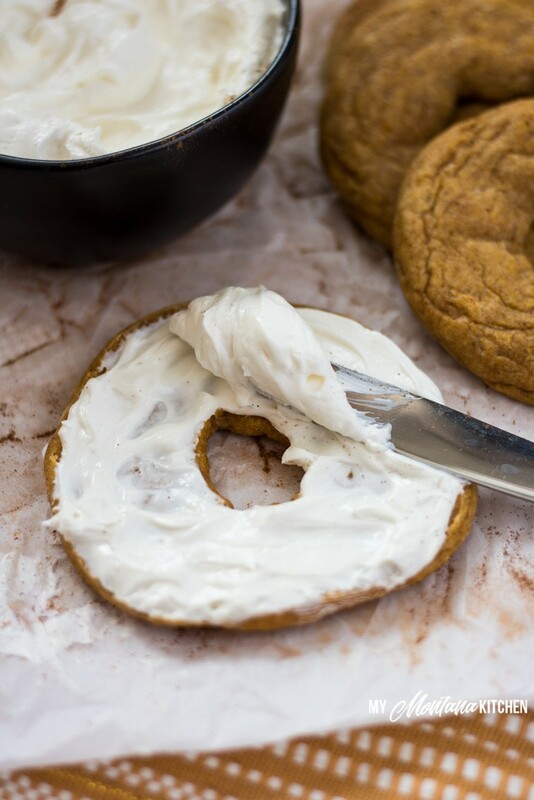 These pumpkin bagels are perfection when toasted, and topped with my Whipped Cream Cheese spread (recipe below)! I recently had an email from a young lady I knew when I lived in East Tennessee. She was telling me that she had a favorite Whipped Greek Yogurt Cream Cheese spread, and wondered if I had a recipe so she could make her own. I found that it was very easy to make, and I loved how fluffy it was! Plus, the Greek yogurt lightened the calories and made the cream cheese much easier to spread. I made sure to keep a dish of it on hand in my refrigerator while I finished off my batch of low carb pumpkin bagels! 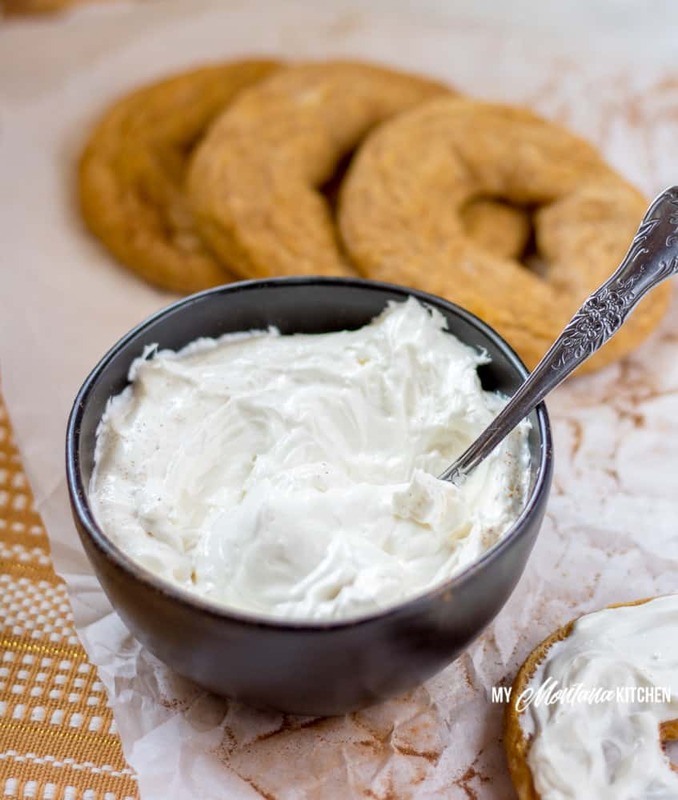 You could add ½ teaspoon of pumpkin pie spice to make a Pumpkin Spice Cream Cheese Spread. Add ½ teaspoon of maple flavoring and 1 Tablespoon of chopped pecans for a Maple Nut Cream Cheese Spread. Add 1 “doonk” (1/32 of a teaspoon) of stevia, dash of vanilla and ½ teaspoon cocoa powder for a light Chocolate Cream Cheese Spread. Or add a dash of cinnamon for a Cinnamon Cream Cheese. Really, the options are limitless! I can’t wait to see what flavors you guys come up with! For the bagels, I’ve found that the easiest way to shape them is to roll the dough into a ball, flatten it with the palm of your hand, then use your finger to make a hole in the middle. I tried rolling the dough into “ropes” and forming circles, but I found that it was just as easy to use the method mentioned above. I hope you’ll give these low carb pumpkin bagels a try. Toast one, top it with whipped cream cheese spread, grab a cup of coffee and sit down to enjoy the cooler temperatures. 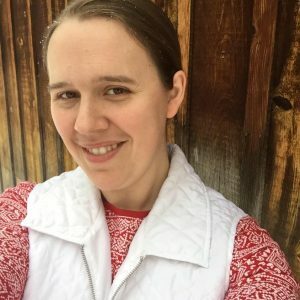 Want a FREE Ebook? 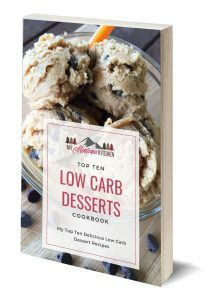 Sign up here for emails and get a free ebook! In microwaveable container, melt shredded cheese and cream cheese until completely melted. Using a food processor dough blade, combine melted mixture with egg, almond flour, coconut flour, baking powder, canned pumpkin, Pyure, and pumpkin pie spice. Turn dough out onto parchment paper, and divide into 6 even balls of dough. Spray your hands with coconut oil spray, then flatten balls of dough with your hand. Using your finger, make a hole in the center, forming a bagel shape.Place on a parchment paper lined cookie sheet. Using a hand mixer beat softened cream cheese and Greek Yogurt until well combined. Store in the refrigerator. Nutritional information is for bagels only, it does not include cream cheese spread. « 30 Low Carb Pumpkin Recipes you MUST try! What a great idea to make bagel dough with pumpkin . I can already imagine the sweet delicious taste! Yum! You read my mind as I was just looking for a yummy bagel recipe! Plus you added pumpkin!